I had a ton of them. I also had the forerunners to them, 4-track and 8-track tapes. Check this out... I actually even had a record player in a car (back in the day...). Awesome post! I remember sitting by the radio, waiting for my favorite song to come on so I could tape it and listen to it over and over. I still have some of those radio mixes somewhere. I should really listen to them! But oh, on what tape player!? 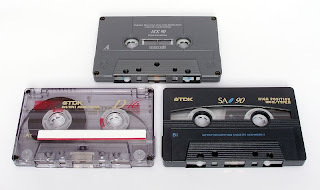 One good thing about the whole digital music thing is fewer cassettes tossed on the side of the road trailing out tape from somebody tossing them out the car window after the car stereo "ate" it. I still have my cassette collection and my first mono cassette player, first boombox, and a stereo system that plays cassettes and records. I even use my cassette walkman at the gym. I do not own any kind of digital music player because they are expensive and I am way too lazy to digitize my huge CD collection. These were the big thing for me, as I was able to record my favorite episodes and cartoons from the tv to listen to later. such a big hassle to wait to rewind them, and they never lasted long. so when you finally can make a backup copy you have too many tapes. as a kid, I had a ton of cassette tapes, and tape recorded lots of things. But those tapes only lasted a few years, and making backups just prolonged the obvious.